Pop princesses come in all manner of packages. There’s the feisty rebel type; the smiley showgirl; those brooding mistresses of gloom. And then there’s the rarest breed of them all: the startling songbird. This is the talent that possesses a vocal range that can shatter glass at a thousand yards and make the hairs at the back of your neck stand on end. Ariana Grande has one of those voices that truly does stop you in your tracks, and no amount of music snobbery or poisonous gossip-mongering can diminish a gift that will surely see her extraordinary career develop strongly in the decades to come. Ariana had set her sights on the stage at an early age and her professional career began on Broadway when she won a supporting role in the musical 13. She’d developed her craft by working with children’s theatre groups in her native Florida, where she’d been born in 1993. The spell as cheerleader Charlotte in 13 earned her a National Youth Theatre Association Award in 2008 and proved the springboard for a role in the Nickelodeon TV channel’s sitcom Victorious. The show began filming in October 2009 and Ariana’s part as the cute and kooky redhead Cat Valentine was well received. She swiftly picked up a sizeable fan following and the series was a hit for the network, soon leading to a second run being commissioned. Ariana says she enjoyed playing the part, but admits that acting wasn’t then as important to her as recording music. The opportunity to contribute to the show’s soundtrack release was unsurprisingly seized upon by the rising star. She made her debut musical appearance with the cast on the track ‘Give It Up’, from the first soundtrack set, which got a Stateside release in August 2011. After also infamously posting clips of herself performing song by established artists such as Mariah Carey, Ariana’s attention-grabbing vocal range had caught the interest of Republic Records. She was duly signed and tracks were laid down for an out-and-out pop album. Lead single ‘Put Your Hearts Up’ heavily sampled 4 Non Blondes’ 90s classic ‘What’s Up?’ and sold steadily in the US, despite failing to crack the Billboard Hot 100. Surprisingly, Ariana now disowns the project, claiming she felt uncomfortable with the song and video. It led to a radical rethink for future record releases. While further soundtrack work for Victorious kept Ariana’s fans supplied with more cover versions, it wasn’t until 2013 and the winding-up of the smash-hit series that Ariana was finally able to focus more fully on her career of choice. The finale of Victorious aired in February of that year and, though Ariana was still committed to a spin-off season of Sam & Cat, she was by now working hard on what would be her debut album. The second single from Mika’s third studio set, ‘Popular Song’, featured Ariana as a guest vocalist and charted modestly in the US, but signaled a fresh style and the start of a series of highly successful collaborations with other artists. Ariana’s first album was finally released in August 2013. Yours Truly debuted at the top spot in the US and charted highly around the rest of the world; lead single ‘The Way’ peaked at No.9. Subsequent singles – including another duet, this time with rapper Big Sean – performed less strongly but did the job of steadily promoting her debut set to platinum status in her homeland. A Christmas EP in December of that year crowned a promising first full 12 months in the music business, which saw Grande named as the year’s American Music Awards’ New Artist Of The Year. She also found time to appear on some tour dates with Justin Bieber and play a small part in the film Swindle. 2014 saw the start of work on Grande’s second studio album, and she enlisted the help of hit-makers Max Martin and Ryan Tedder to make sure this set moved her up to the next tier of success. Lead single ‘Problem’ proved to be a phenomenal start to the My Everything campaign when it peaked at US No.2 and even topped the charts in the UK. Featuring Australian rapper Iggy Azalea, this confident, breezy classic was a crossover smash and was a noticeable step up from Ariana’s previous work. My Everything duly debuted at the top of the Billboard charts. During this winning streak, Ariana was invited to perform at the White House for the Obamas and was also crowned at the People’s Choice Awards. In autumn of that year, Ariana guested on Saturday Night Live and appeared as a featured vocalist on the Major Lazer track that was included on the soundtrack for the film The Hunger Games: Mockingjay Part One. In parallel to this phenomenal professional output, Ariana’s commitment to a range of good causes was by now being widely recognised as she has made a number of commitments to projects close to her heart. In particular, she has regularly supported cancer charities and programmes helping those suffering with HIV and AIDS. After successfully smashing her way into the charts, it was time for Ariana to finally prove she could cut it live. The Honeymoon Tour crossed the world and saw her perform on 81 dates; the slick show earned generally good notices, but it was Ariana’s powerful vocals that made the lasting impression. A set of guest appearances in the Ryan Murphy-helmed comedy-horror TV hit Scream Queens kept her acting hand in, while work also began on her third album. An early track from those sessions, ‘Focus’, was released in October 2015 and made the Top 10 in most markets, including No.7 Stateside. And still there seemed no let-up in Ariana’s incredible work ethic, with an operatic duet with Andrea Bocelli and a second Christmas EP completing what would by anyone’s standards have been another standout year. A brief cameo in the hit movie Zoolander 2 kicked off 2016 and, in March of that year, Ariana released the second single from Dangerous Woman. The title track of her third album immediately followed its predecessors into the upper reaches of the international charts and was to prove a strong springboard for the third album’s commercial campaign. The debut album from Ariana Grande, 2013's Yours Truly, is a surprisingly sophisticated and unique showcase for the Nickelodeon sitcom star's soulful R&B vocals. As the character Cat Valentine on several Nickelodeon television shows including I Carly, Victorious, and Sam & Cat, Grande developed a huge fan following and the expectations were high for her debut album. Three years in the making and held up by numerous delays, Yours Truly lives up to those expectations. Produced by Kenneth "Babyface" Edmonds, Yours Truly is an impeccably engineered affair. In fact, one would be hard-pressed to find a better platform for Grande's voice. A resonant singer gifted with a lithe affinity for both high-energy melisma and gentle balladry, Grande often brings to mind the intonations of Mariah Carey. Of course, with Edmonds at the helm, along with a bevy of commercially minded songwriters, the Carey comparisons are unavoidable and most likely intentional. Thankfully, Grande has the chops to pull it off, and Yours Truly makes the most of her talent. To these ends, tracks like the opening "Honeymoon Avenue," with its sophisticated orchestral intro, and the bright and funky "You'll Never Know" sound like lost early-'90s R&B hits. Though Grande has the talent to carry the album on her own steam, several tracks team her with guest performers, including the single "The Way," which features rapper Mac Miller; "Right There" with Big Sean; and "Popular Song," featuring Mika. Ultimately, cuts like "Baby I" and the jazz-inflected showstopper "Almost Is Never Enough," featuring the Wanted's Nathan Sykes, are bravura pop recordings that bring to mind the best of the '90s and of now. Ariana Grande took her first tentative steps into adulthood with My Everything, the 2014 album that tempered her retro-diva stance with modern R&B. 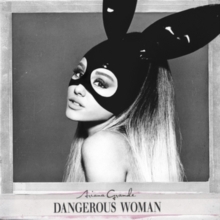 Released two years later, Dangerous Woman consolidates this soulful shift while offering a snazzier, sophisticated spin on the '90s pop that provides the foundation of Grande's music. Much of the latter comes from a fruitful partnership with producer Max Martin and his colleague Ilya, a team responsible for over half of the standard album's tracks (they also have their hands in several of the deluxe edition's bonus cuts). Tommy Brown and Mr. Franks are the other chief collaborators here, shepherding many of the cuts with a heavier R&B influence -- the stuttering "Let Me Love You," featuring a verse from Lil Wayne, the slow-burning torch of "Leave Me Lonely" -- but their productions aren't far removed from the Martin/Ilya cuts. "Everyday," a heavy thrumming jam featuring Future, is helmed by Ilya alone and the Rihanna-copping "Side to Side" bears a Martin credit. What all the producers do is keep the focus on the individual track, carving it into a seamless sculpture of rhythm and melody where Grande winds up as the accent to the song. Restraint serves her well: there are times she lets go with a full-throated roar, but Grande spends most of Dangerous Woman at a simmer that reinforces the sultry seduction of the title. A fair chunk of the album is devoted to cinematic ballads, which makes the bright blasts of disco -- "Be Alright," "Greedy" -- so alluring, but the entire record benefits from this single-minded concentration. Track by track, Dangerous Woman has sly, subtle distinctions -- a little bit of torch gives way to some heavy hip only to have frothy pop surface again -- and while some of these cuts work better than others, the range is impressive, as is Grande's measured, assured performance.